Goldenteak's Teak Steamer Chairs are designed for maximum comfort and durability. These Teak Steamer Chairs use only Solid Grade A Teak wood which has been sustainably harvested, and solid brass fittings. 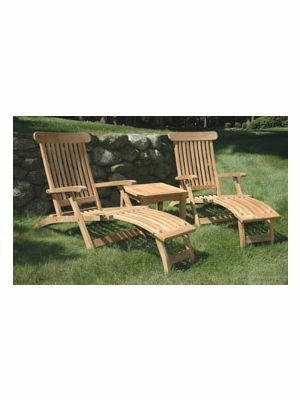 The Teak Steamer Chair has 8 slats for strength and comfort, reclines to about 135 degrees with five positions. It folds compactly for storage. Shipped folded. No assembly required. Our Steamer chair cushions are available in a variety of colors from Sunbrella, and can make the Teak Steamer Chair even more comfortable.